BRMi’s experience supporting many small and large agencies points to IT investment transparency as the single largest enabler of improved efficiency. Investment transparency reveals where agency resources may be allocated, unnecessarily, toward duplicative mission delivery processes, systems and data sets. This revelation permits agencies to carefully redirect unproductive resources to process and technology renovation priorities. Creating transparency is one key outcome of an effective IT management process. 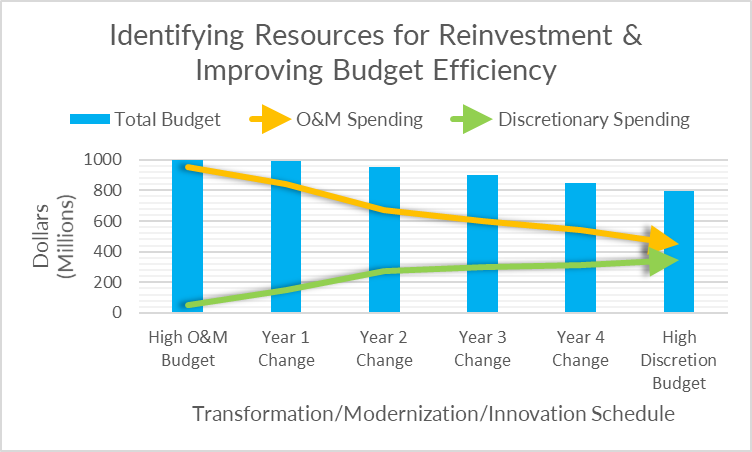 Today’s fast paced demands for achieving greater efficiency do not lend themselves to traditional enterprise-wide analysis approaches, which may take more than one annual investment lifecycle to complete. BRMi applies its Agile expertise to create investment transparency through short iterative analysis cycles that are tailored to specific stakeholder pain points, programs, or customer groups. Leveraging our IT management framework, our clients have identified millions in resources for reinvestment into process improvement or systems modernization. Contact us for more information at [email protected] to see how we can help you get started.